"In some respects, a peer personality gives heavy focus to the attitudes and experiences of the generational elite...('the heads of society, the kings of thought, the lords of the generation'). But while they commonly express the tone of a generation's peer personality, the personality itself is often established by non-elites" (Generations page 64). 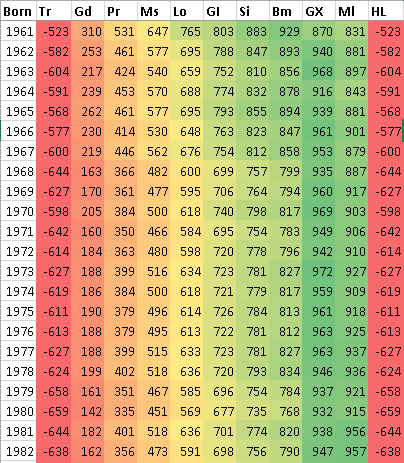 The following table shows PA and BF totals and attribute rates for the 1964 cohort. I listed all batters with at least 8,000 PA and all pitchers with at least 8,000 BF ("the generational elite"), all other batters and pitchers (the "non-elites"), and the cohort totals. As you can see, the "non-elites" as a whole overwhelm "elites" in raw numbers of PA and BF, but elites still obviously have a lot of impact on their cohort's attribute rates (Barry Bonds accounted for roughly 6% of his cohort's total plate appearances, while Kenny Rogers pitched to about 8% of its batters faced). (Batting stats for pitchers are included in "All other batters"; pitching stats for position players are included in "All other pitchers"). But like I said in part one, these are social generations. Strauss & Howe were trying to identify generations based on how they shape and react to history and each other. My goal is much simpler: I want to identify baseball generations based on how (if at all) they played major league baseball. In part two I defined my tool for identifying baseball generations: similarity scores based on attribute rates. I'll use the Strauss & Howe generations as a starting point. Then I can ask of each cohort, does it actually belong in this generation? or should it be in a neighboring one? As you can see, each cohort is in fact more similar to Generation X than it is to the Boom Generation, except for the first one, 1961, which is more similar to the Boomers (929 to 870). So based on these numbers, the 1961 cohort belongs in the Boom Generation instead of Generation X. So what I did is compare every cohort to every generation. Starting with the firstborn major leaguer (Nate Berkenstock, born 1831) and ending with 2016's youngest player (Julio Urias, born 1996), I have 166 MLB cohorts. And there are eleven generations, although the first and last (Transcendentals and Homelanders) are statistically identical, because their members had no major league experience. To find the statistical similarity of a cohort and a generation (or of any two players or groups), start at 1,000 and subtract a penalty for each attribute rate. The penalty is the difference (or absolute value) between the cohort and the generation, times a multiplier. The multiplier is the weight I assigned to the attribute rate, divided by (4 times its standard deviation). I have 166 total cohorts, but for standard deviations, I only wanted to include cohorts with at least 10,000 total PA and 10,000 total BF, so I limited my population to the 143 cohorts born between 1850 and 1992. I wanted the weights of the "three true outcomes" rates ($BB, $SO, and $HR) to be double the other weights, because they use both hitting AND pitching stats, while the other rates only use one or the other. And I wanted the weights to add up to close to 1,000, so that if two groups are exactly four standard deviations apart in every category, they will have a similarity score near zero. Don Mattingly's 1961 cohort has a $HR rate of 2.9%, while the $HR rate of Generation X overall is 3.6%. For the similarity score of that cohort to its generation, the $HR penalty is .007 (.036 - .029) times the rate multiplier of 3,806, or about 27. 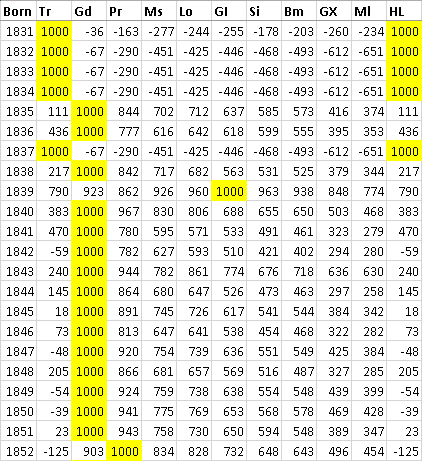 Add up all eight penalties and subtract from 1,000, and that is the similarity score. And next to it, I made another table. 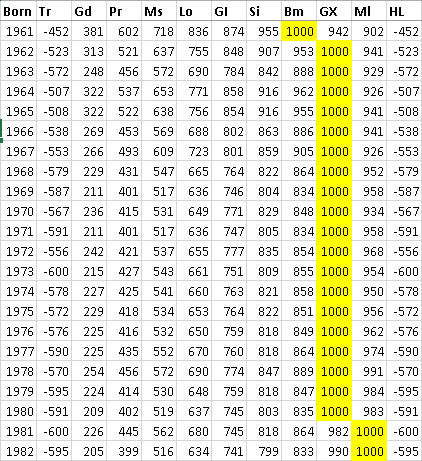 For each cohort I added a variable to its similarity scores so that the highest score always equals 1,000, and then I highlighted all the 1,000's. It's not as pretty as the above table, but it's more useful for showing which generation each cohort belongs in. Generation X's last-born cohort, 1981, also jumps ship, going over to the Millennials. And this is in fact where I end up for the birthyears of baseball's Generation X - 1962 to 1980. But I didn't start here. I started at the beginning. 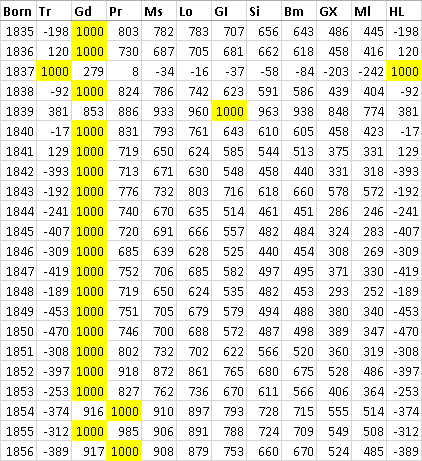 You can tell from the above table of highlighted 1,000's that most of the 1835 to 1851 cohorts were already more similar to the Gilded Generation. But before I even look at the similarity scores again, I'm enforcing a minimum length for these generations. The shortest Strauss & Howe generation is 17 years; I'll relax that by one year and say the baseball generations must be at least 16 years. All things have a beginning, and so must the story of baseball generations. I start with the cohort-group of 1835 through 1856. I call it the "National Generation." 469 members of this group appeared in at least one major league game. (For the purposes of this study, I consider the National Association, 1871-1875, a "major" league; it certainly was to Harry Wright and his peers). It includes every member of the 1869 Cincinnati Red Stockings (the first openly professional team), nearly every player in the National Association (the first professional league), and most of the players in William Hulbert's National League (1876-1881). A couple of earlier-born players appeared in the National Association, but they were both forty-somethings who played just one game each. Besides them, the firstborn MLB players were Harry Wright (born 1835) and Dickey Pearce (born 1836). Both played seven years between the NA and NL, and both were key pioneers of the professional game.